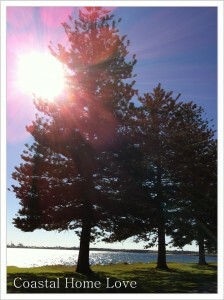 Hope you all had a wonderful sunny weekend! We enjoyed soaking up the Winter sun at Botany Bay National Park, Kurnell. The kids had a scooter ride through the park, hubby and I strolled whilst enjoying a stunning view of the bay, and city beyond. 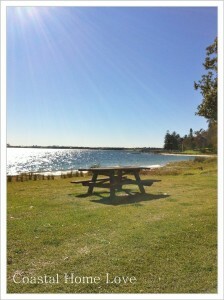 Such amazing blue skies in Sydney today! 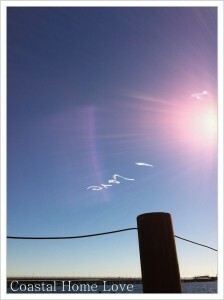 Perfect for a romantic gesture on a grand scale… awwww I love sky writing! 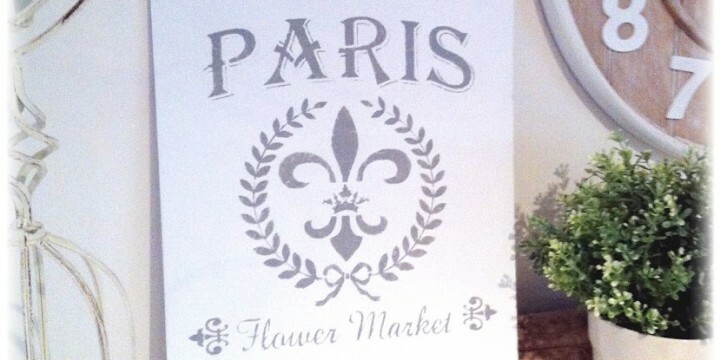 I got to pop into one of my fav shops, Free Range Living… if you’re local you’ve got to check it out! 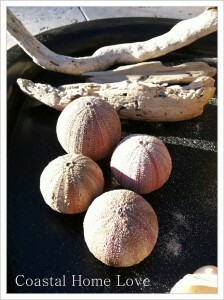 Deni has beautiful Australian handmade goodies, fashion, gifts, devine artisan breads and lots of crafty goodness! 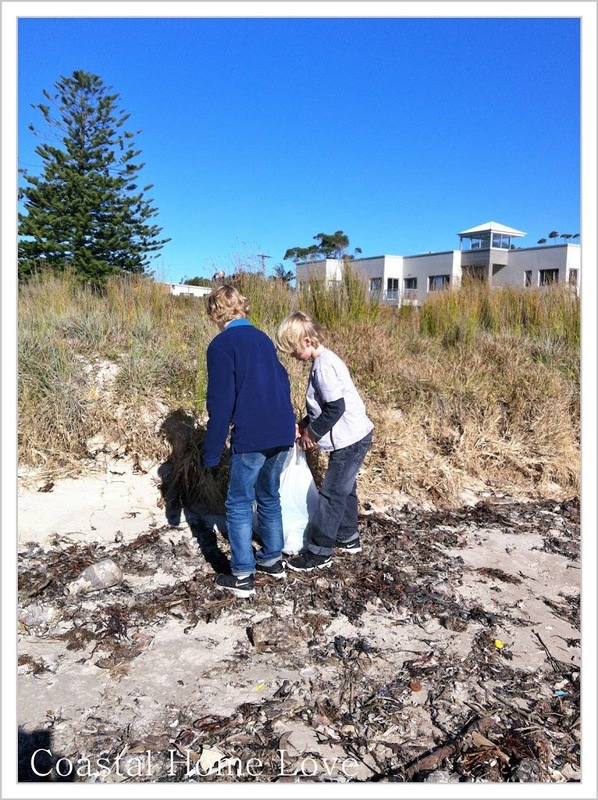 The kids and I had fun finding lots of wonderful treasures whilst beachcombing!! 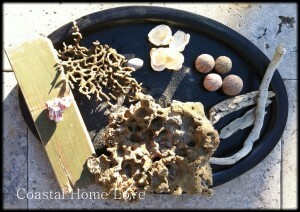 I love driftwood, shells and sea glass and have always loved finding these treasures of the sea. Today we scored some beautiful pieces of sea sponge, some small but perfect sea urchins and a few shells and driftwood. 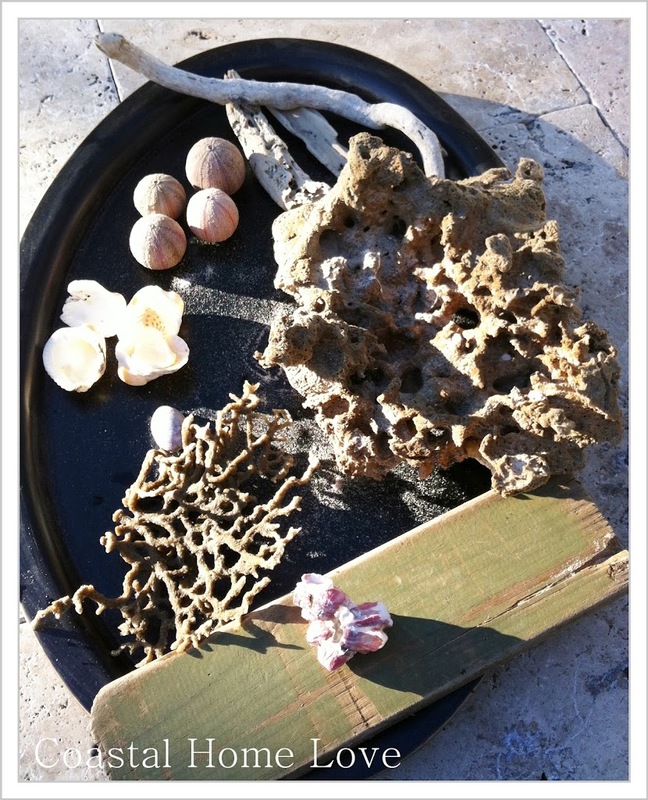 I just love to decorate with things from Nature and I can’t wait to clean this haul up (it’s kinda stinky), and display these pretties inside. Isn’t Mother Nature amazing? The last few times we have visited the kids have really noticed this. So this time we took a big garbage bag and filled it with plastic bottles and rubbish. We probably could have filled a dozen more. Have you found any lovely treasures lately? 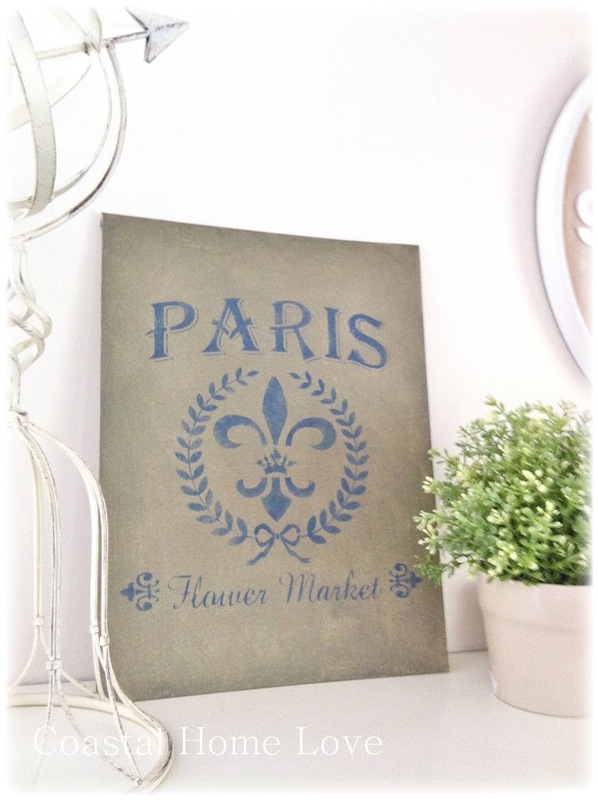 Shabby Chic Stencilling fun & My first Give Away! 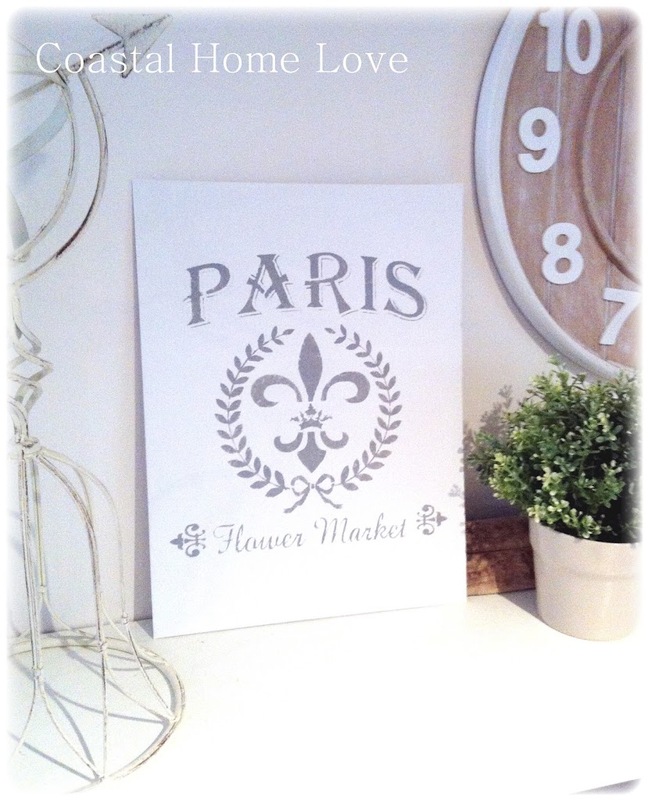 Soooo to celebrate reaching this milestone I’m giving away one of these Paris Flower Market signs…. I have been having fun creating some signs. 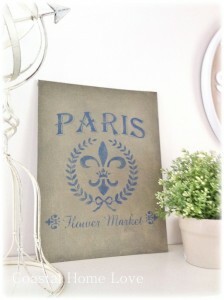 They are hand painted and stencilled on thick canvas art board. 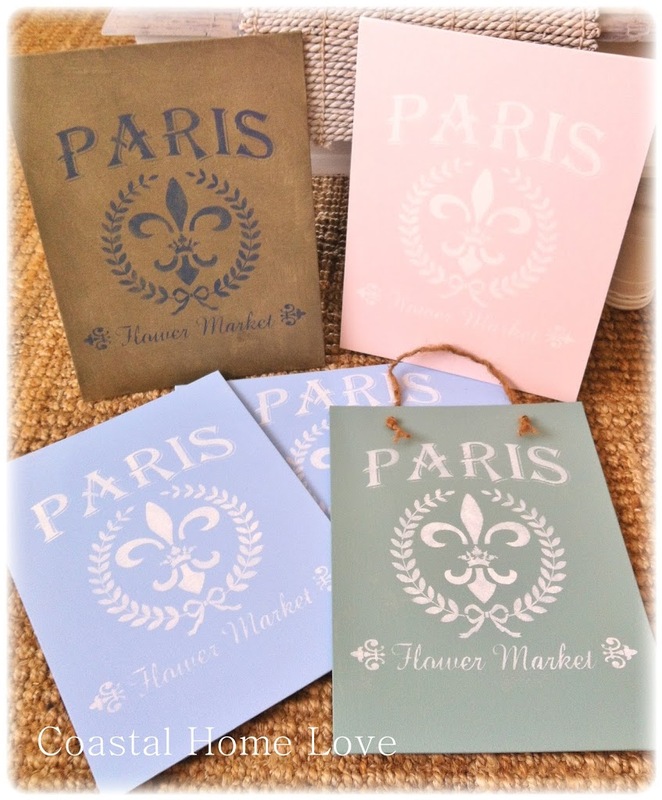 I’ve been playing with different colour combos; What colours would you like to see?? 1) ‘Like’ Coastal Home Love on Facebook (please note this needs to be from your personal Fb account!). 2) Share page on Facebook with your friends! 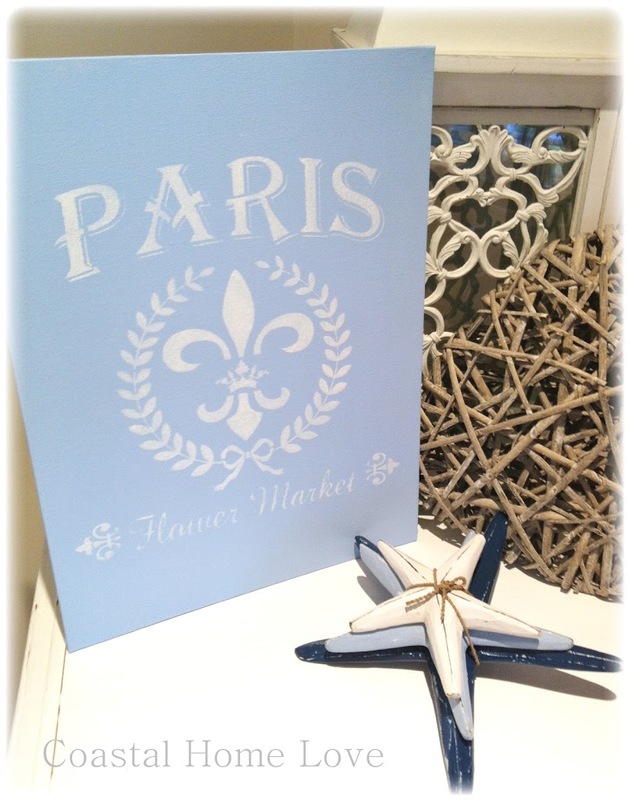 3) Email Coastal Home Love (coastalhomelove@gmail.com) letting us know you have completed steps 1 & 2, and advise what colour you would choose if you win! Easy Peesy! ~ Like… Share… Email! Giveaway open from 17 June 2012 and will close midnight on 30 June 2012. Open to Residents of Australia. Entrant must ‘like’ Coastal Home Love Facebook page and share with friends on Facebook. Entrant can be an existing liker or a new liker. 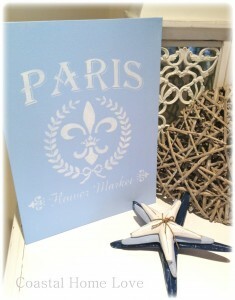 Entrant must email Coastal Home Love stating preferred colour choice and that they have met entry conditions. Prize includes; One Paris Market Flower Sign (choice of available colours) and includes postage within Australia. A winner will be chosen using random.org. 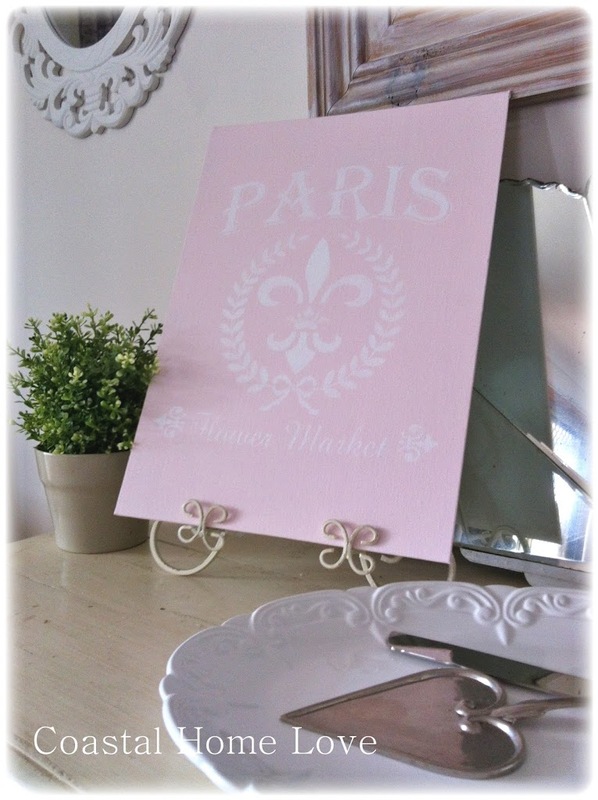 Winner will be notified by email and I will announce winner on my blog and on Facebook! Please note this giveaway is in no way administered, sponsored or endorsed by, or associated with Facebook. Entrants are providing information to Coastal Home Love and not Facebook. 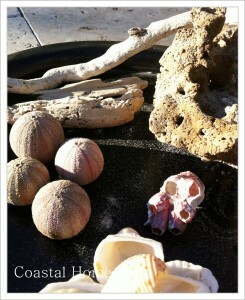 Email information will not be passed on by Coastal Home Love. 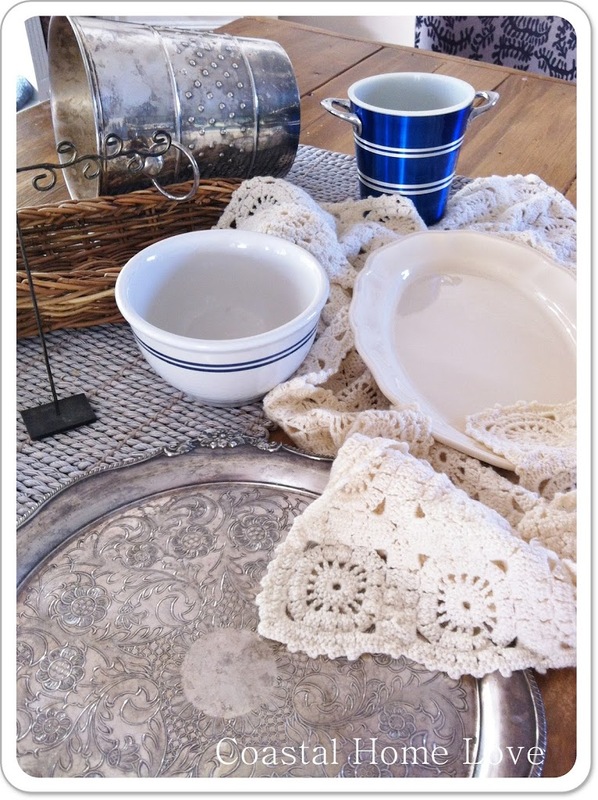 Why I Happy Danced through this week and some Vintage Treasures! I seriously have no idea where the last week went… absolutely flew by! There are just never enough hours in the day. Since I last posted lots of stuff has happened… lots! Two crazy exciting things happened… I won a prize, me, I never win stuff! 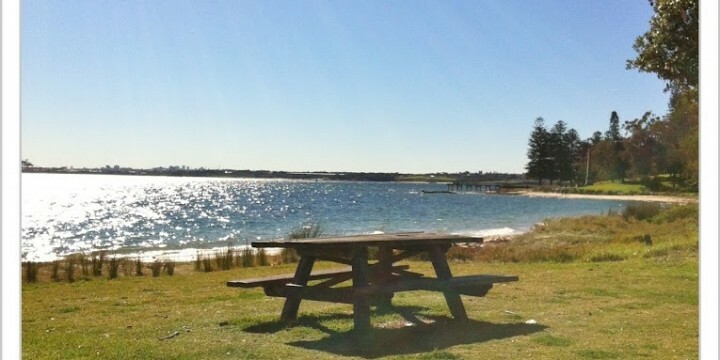 Then if that wasn’t enough; the cherry on top came yesterday… I got home after a long day, to find a story published by ShireWomen on their Facebook and web pages, about Coastal Home Love! Big huge thank you to Alison and Rebecca for this feature article, you girls rock! So I have pretty much happy danced through the entire week! 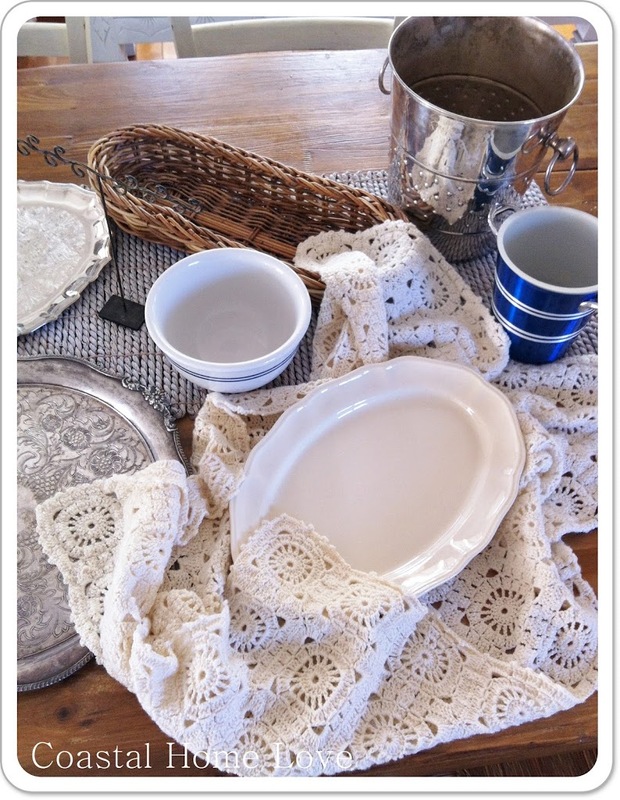 I’m sorry that was all rather wordy, so to balance I have some pretty pictures now of a some wonderful vintage treasures I found this week. I heart treasure hunting, and got lucky with this haul! 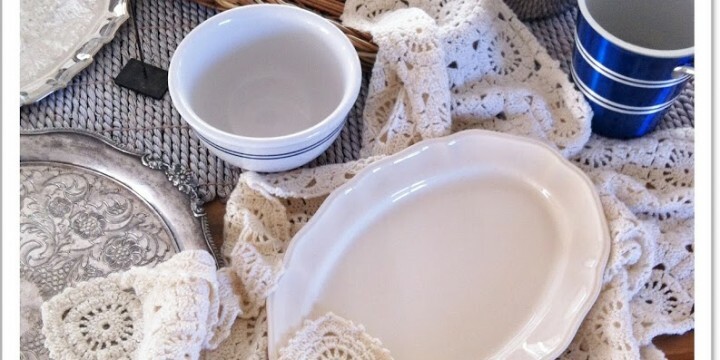 The cream crochet blanket, I love! ; it’s the perfect size for draping over knees (Nana style), or hanging over the back of a chair and it’s made of wool, no marks or pulls… Score! 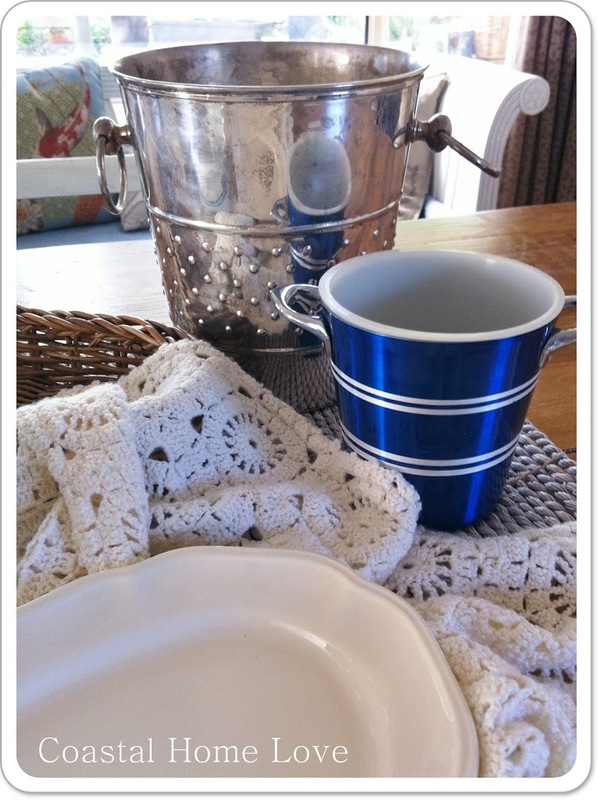 I found a cute wicker bread basket, a lovely oval shaped platter and a white ceramic bowl with twin blue stripes. I also found a little tree thinga-ma-bob on a stand, I think it’s for jewellery, it’ll get a little spray job and sit on my dressing table. Now I may or may not have a thing for ice buckets; I mean how many does one need after all? But I just can’t seem to pass them up…. Two more join my little collection, including a stainless steal one, just a little bit posh, and a lovely little vintage enamel, nautical style one… glee! Wishing you all a wonderful Mother’s Day weekend!